Ghana is one of the most accessible countries in Western Africa and is rapidly becoming a top tourist destination. This dedicated country field guide uses illustrations from the acclaimed Birds of Western Africa, which have been recomposed into a new set of plates, with new text and maps specific to Ghana. 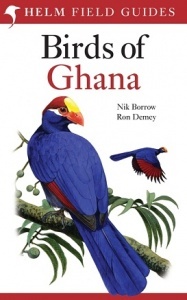 The result is a compact and up-to-date guide to all the birds of Ghana, and neighbouring Togo. The guide covers 758 species, including all residents, migrants and vagrants, contains almost 2000 colour illustrations and distribution maps for every species. Paperback, 352 pages, 145 colour plates, maps.